So, as you may or may not know, Scott and I have been planning our move to Chicago for a while now. 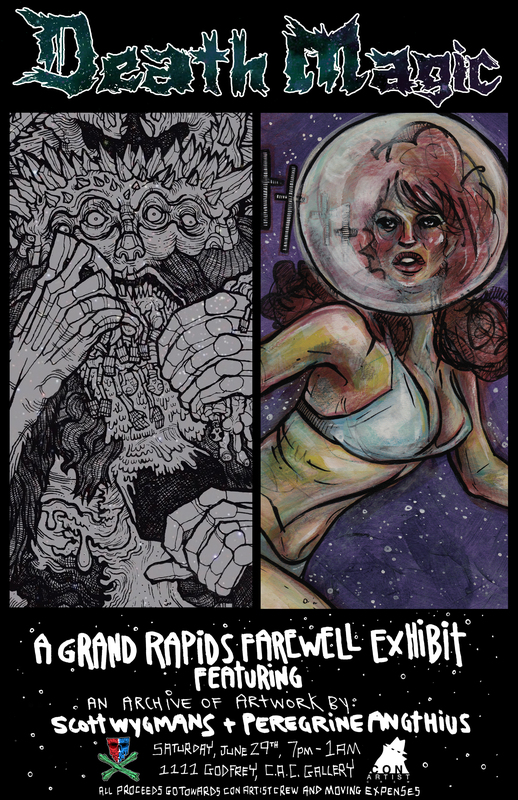 If you’re in the Grand Rapids area on June 29, 2013, we would love to see you at our farewell show/party, Death Magic, at the Con Artist Crew spot – 1111 Godfrey. We are putting up a ton of work, old and new, and all proceeds from sales go towards helping to get our butts outta GR safe n’ sound, and to keeping CAC wheelin’ and dealin’. There will also be an opportunity to pick up our comics at the American Dirtbag Comics table. So, come drink and be merry, and spend the night with your two favourite garbage people. Hope to see you there!